Tracking down hop drying operations of the 17th C means delving under the surface of buildings rather than just looking for tall kilns and cowls across the countryside. 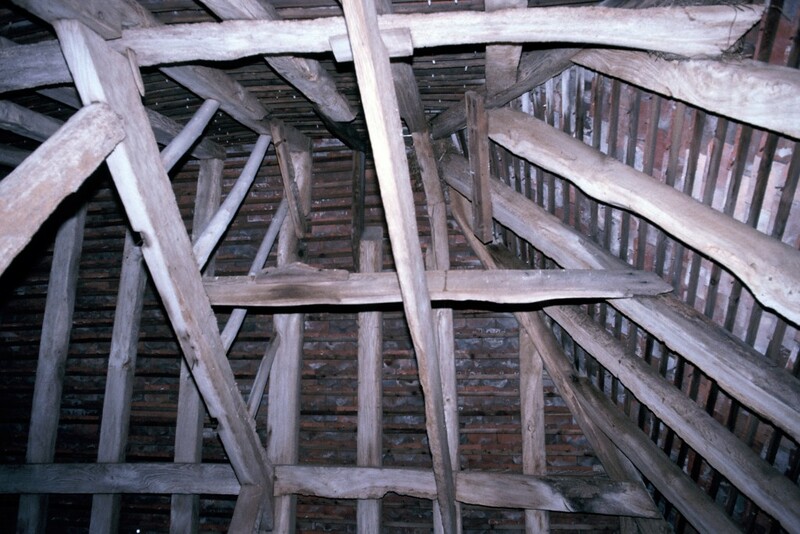 The main evidence in timber framed buildings of the period is found in the beams and rafters of the roof. 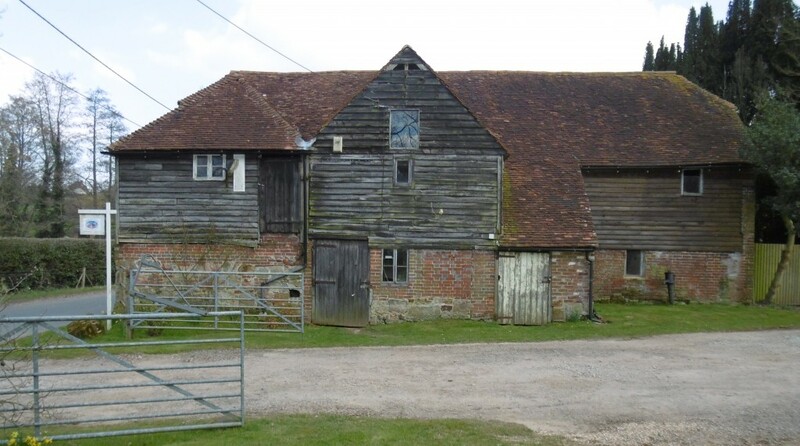 The Historic Buildings Research carried out by David and Barbara Martin on farm buildings in Sussex and the work of Gwen Jones on oasts demonstrated this. 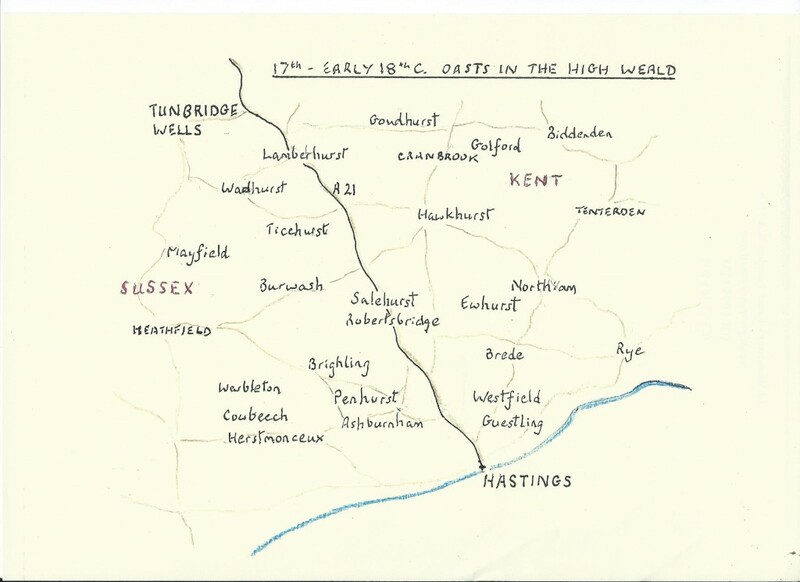 Many of the detailed notes and drawings made by the Martins can be seen in the East Sussex Records Office (ESRO) in the Historic Buildings Record (HBR) series. 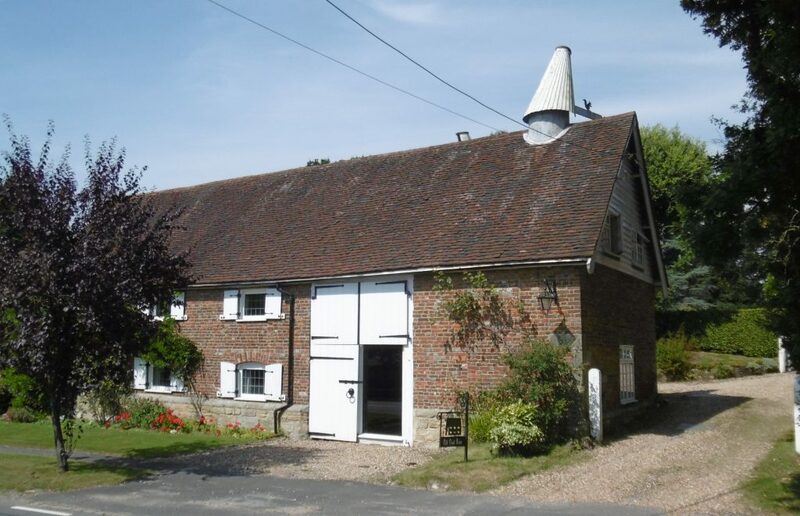 Homestead Farm, near Brightling, Sussex. ref ESRO HBR 0366. 1979 David Martin. 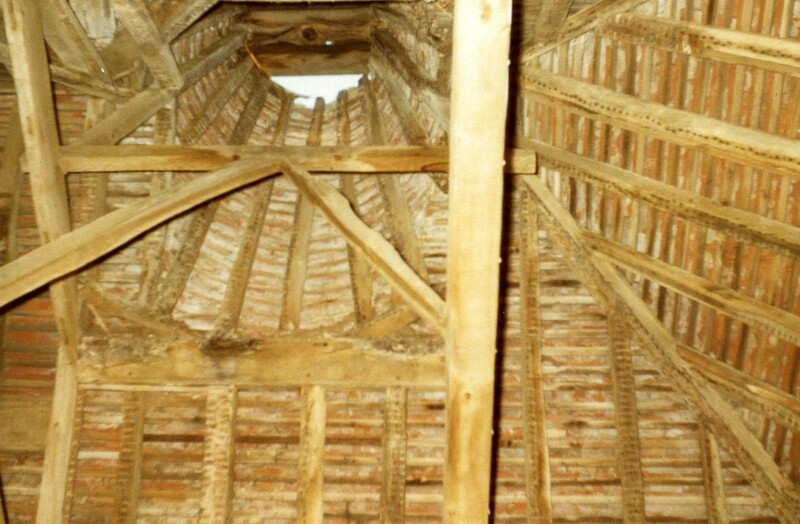 Photograph taken during restoration, after lathe and plaster has been striped off , but before conversion to a dwelling. 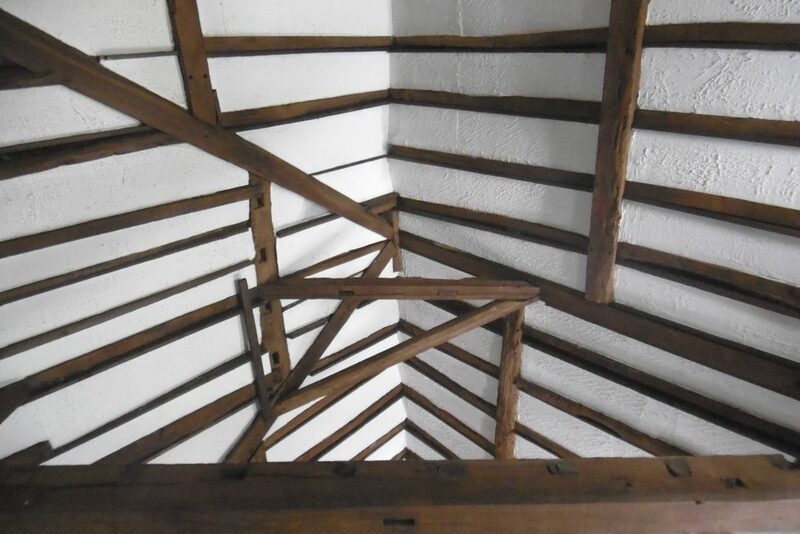 Two collar beams linking the rafters on either side of the roof to support some of the vertical timbers of the cone. Making notched indents in the other rafters to provide a base for more timbers for the cone. 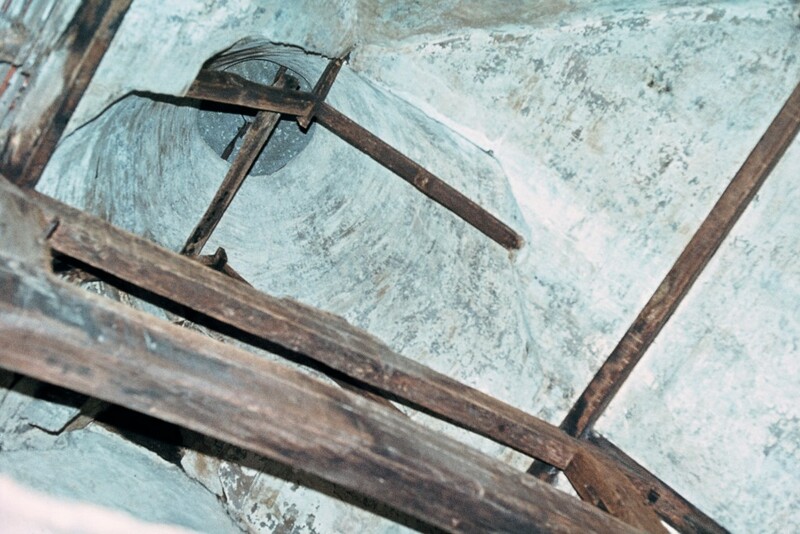 In some cases, this kiln construction evidence is supported by signs of burning and staining on the rafters. 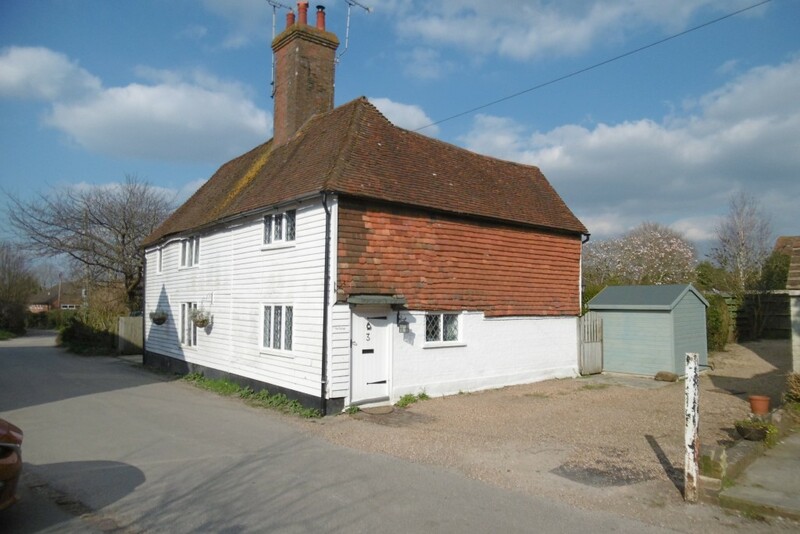 A typical example is Hoppers Croft, Burwash, (ESRO 0921) opposite the Rose and Crown . This has been a dwelling since the early 18th Century but when built in the 17th Century it was for hop drying. As the photograph shows it is only the name of the buildings which betrays any connection with hops. 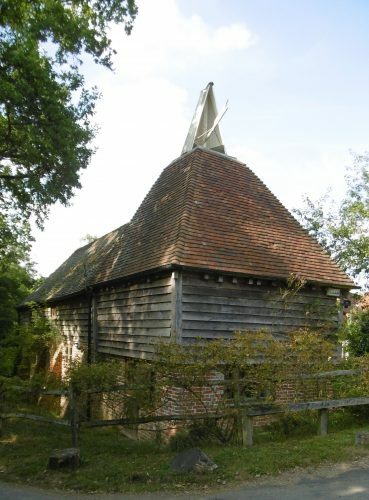 A good example of a “barn style “oast is at Cooper’s Green, near Uckfield, East Sussex. 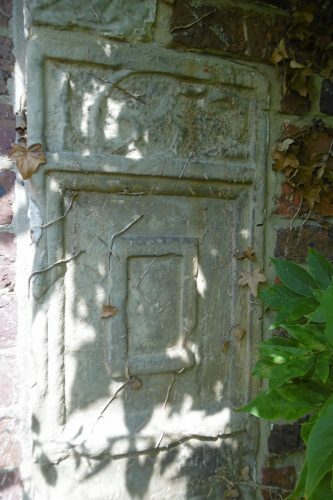 It has the advantage of a carved date stone, 1652, though this does not of course prove whether it was built for hop drying or took on that role later on. it was converted into a dwelling some years ago, but the timbers in the roof have been cut about above the former drying floors. Coopers Green near Uckfield, East Sussex. 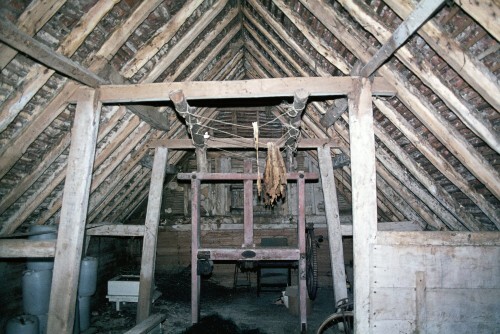 Duvals, Hawkhhurst Interior with timbers cut away and curtain beams across the roof to support a funnel up to the kiln. G Jones 1990s. Duvals is in the village of Hawkhurst on the Kent Sussex border. The exterior shows no signs of use for hop drying. But inside the timbers are cut away close to the ridge of the roof to allow for a vent above a kiln. The collar beams provided strength and a platform for a funnel up to the vent. 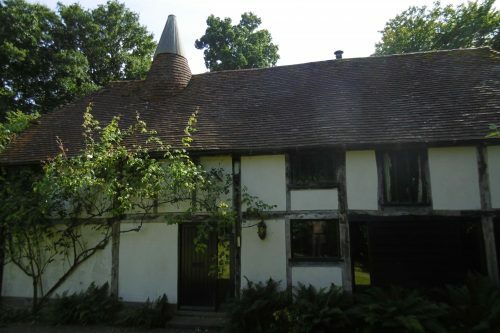 From a rather later date is a barn style oast at Hampden Lodge Mayfield in East Sussex. Inside the building the inverted apfunnel above the drying floor up to the vent is plastered. Since these photographs were taken the building has been converted into a dwelling. 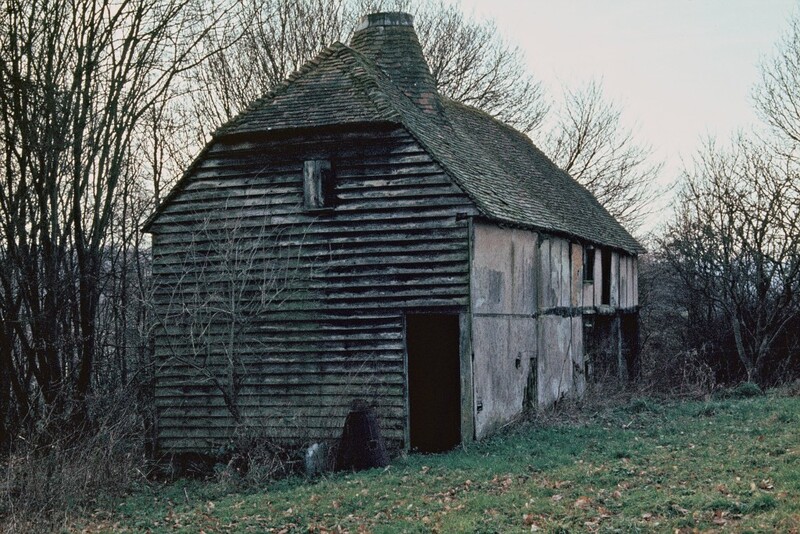 The Sussex Historic Buildings Survey has identified 15 or more sites where hop/barley drying took place in barn-style buildings at some stage from the later 16th and up to the early 18th Century. The distribution is shown on the map. 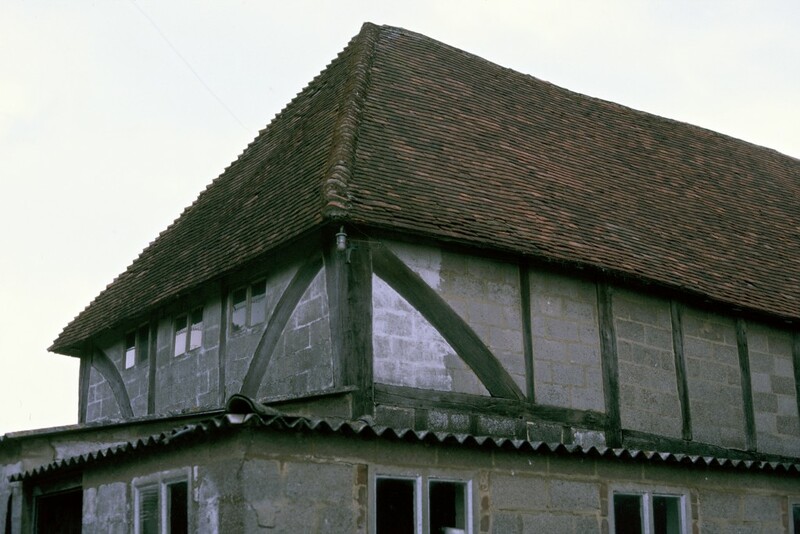 Given that equivalent detailed studies have not taken place in Kent (and that the modifications of roof structures might well pass unnoticed amongst those not aware of their significance) the assumption must be that remnants of early oasts are scattered liberally across much of Kent but have not been identified. Modernisation of many farm buildings in recent decades may have obliterated the evidence in some cases. Beestons, Warbledon ESRO HBR 0496. A structure of many periods with surviving bagging hole inside.